Baytex Energy Corp. is an oil and gas corporation based in Calgary, Alberta. The company is engaged in the acquisition, development and production of crude oil and natural gas in the Western Canadian Sedimentary Basin and in the Eagle Ford in the United States. Approximately 77% of Baytex's production is weighted toward crude oil and natural gas liquids. Baytex's common shares are traded on the Toronto Stock Exchange and the New York Stock Exchange under the symbol BTE. 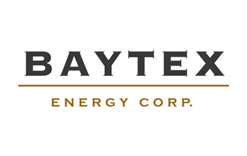 Baytex Energy Corp. is a Calgary-based Canadian producer, developer and explorer of oil (mostly heavy but also lighter conventional) and natural gas. Though formerly a trust it converted to a corporation January 2011 because of government changes to tax incentives. Jobs in Baytex Energy Corp.